This week, we were asked by one of our favourite brands ModCloth to put together an outfit for their weekly Polyvore outfit challenge. ModCloth is an amazing US fashion company that sells Indie, Vintage and Retro inspired clothing and accessories. Sammy is happy as they also do Plus size and they now ship to the UK, yey. They have even now branched into selling things for your home - or apartment if you are in the US. So now you get to look amazing and have your house look amazing too. Then there is Polyvore - which is now a new obsession for Sammy I think! It is a website where you can put looks together from all kinds of different clothing companies, so that you can see what it all looks like together, get outfit inspiration and shop the looks too. I guess it's a bit like Pinterest but just with clothes and you can add bits together to see a complete look. Once you have made a look though you can share it on the site and on your blog/Facebook so that others can see it and see what you have come up with. Back to the Polyvore outfit challenge. We were given the ModCloth Mint Cute Dress to build an outfit around using up to seven other ModCloth pieces. So of course we decided to make it very appropriate for the transitional Autumn time of year here in the UK. We do both have similar clothes tastes, but it was fun trying to find a balance that both of us liked. We went with a Chunky knit cardigan and brogues to make the look a bit more relaxed. The chunky belt and necklace tie the dress together with the cardigan and we would throw on a pair of grey tights too (Modcloth have a fab selection) as it is usually a little chilly. The bag is a really nice version of a satchel bag and of course everyone in the UK needs an umbrella at some point and so why not go for a Rainbow! We are always trying to get the most from our summer dresses by working them up for Autumn/Winter. What do you think to the look? How would you style the dress? Would you keep it casual like ours, rock it up or make it very wedding appropriate? Monday is World Architecture day so I thought it was only right to make this weeks Friday favourites all about our favourite architect. H and I both studied 3D design at college and learnt a lot about architecture in our three years. One Architect/designer became a favourite for the both of us, So much so that H wrote her dissertation all about him. 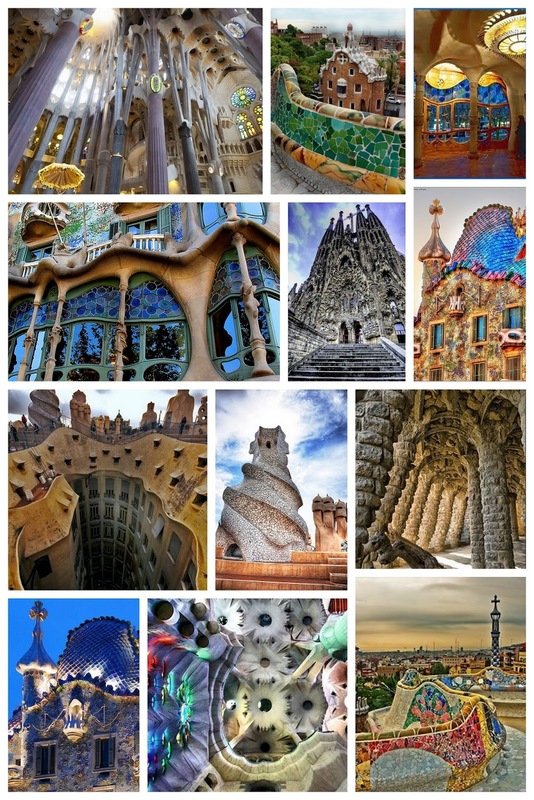 (25 June 1852 – 10 June 1926) was a Spanish Catalan architect born in Reus, in the Catalonia region of Spain and leader of Catalan Modernism. Gaudí's works reflect his highly individual and distinctive style and are largely concentrated in the Catalan capital of Barcelona, notably his most famous still unfinished cathedral, the Sagrada Família. Earlier this year I discovered a little hidden gem, just a 10 minutes drive from where I live, I love it when that happens. Steve and I were driving to High Wycombe via Marlow one weekend and drove past a little collection of shops, I asked Steve if we could stop in on the way back to check them out, I am so glad I did. We had discovered Homebarn! I loved it there so much I took H back for a visit and to meet up with the one of the owners Sarah for a chat. Hi Sarah, Can you tell our readers a little about yourselves? We are Sisters in-law Sarah and Sally Wilkie and we run Homebarn. We are partners with our husbands also and together we all run a design agency called The Narrative. The Narrative is a multi-disciplinary agency encompassing Branding, Fashion, Web, Graphics and interiors. Sally and I help the boys out mostly on the trade interiors side. We are currently working on several hotels, bars and restaurants. As well as our day jobs we also both have young families, It is nice to have a carer that mean we can work with our families and can be flexible around our children. How did Homebarn come about? Sally and her husband James returned from spending many years in the USA as fashion designers. Sally was looking to combine her flair for interiors with a job which would allow her to work around her small children. I had worked in retail interiors as a buyer for several years before starting a family. We were both fans of vintage style and antiques and we began Homebarn by selling several pieces from our own collections privately and then realising that we would enjoy working together and creating a vintage homewares brand. Homebarn was really begun as an extension of a creative hobby. What is your favourite part of the business? We love shopping for stock, that is still so much fun. We have met some lovely people along the way, many of our cabinetmakers and suppliers are now really good friends. We love helping to style the shop and enjoy being hands on with the photography and social media side of the business. Which of all the pieces you have recovered/restored has been your favourite? Old shop fittings such as Haberdashery counters are a favourite - in fact any piece of furniture with lots of drawers we can not resist! What is your least favourite part of running Homebarn? Hauling heavy pieces of furniture around is extremely hard work and not much fun. Also It's very cold in the winter and in the mornings before we have lit wood burner it's really bitter. What does the future look like for you and the business? Popping up elsewhere regularly seems to be on the cards in the short term, we are about to 'pop up' at Tent London and we have plans for other pop up's this year and next. We are looking forward to working more with clients on the commercial side which is looking very busy for next year. We are developing our own range of 'own brand' products including furniture, artwork and gift items. If you could go back to the beginning what piece of advice would you to give yourself ? Don't try and cover all bases, stick with what you love and don't spread yourself to thin. Thanks so much to Sarah and her team for having us, I Love that the business grew organicly from your passions, and that all the family are involved. Some great advice there for anyone starting a business. We had such a lovely afternoon looking around this little Aladdin's cave of vintage goodies. There were so many things that have been added to our wish lists after our visit. It was a pleasure to walk around the barn taking photos and dreaming of where we could incorporate pieces in to our homes and for me Sew Crafty. My favourite thing about Homebarn is the way they lay things out in mini dioramas, so things are sorted by room and displayed beautifully. If you are near by its totally worth a visit, if you are a little further away, still worth a visit, and if you are even further away you can buy on-line! All the details you need can be found on their website, go check it out, its just lovely. Next Tuesday, the 1st of October marks the beginning of Breast Cancer Awareness month here in the UK so its a great time to show your support for the great work that this and other Breast Cancer charities do to help us have a Future Free from Breast Cancer, a World Free from Breast Cancer. You may remember our recent post about our trip to the Breakthrough Breast Cancer HQ and the Great Pink Bake Off? Well, the other reason we were invited up to BtBC HQ was to view their Autumn/Winter Fashion and home accessories lines. Breakthrough are always working hard to get the best brands on board to donate a percentage of the retail price of these products to their charity and this season was no exception. From brands they had worked with before like Ghd and Debenhams to newer homeware lines from Sainsbury's and Laura Ashley, to accessories from Stella and Dot, it was a sea of pink glamour. We were treated to lunch of wraps and yummy sandwiches from Tossed, the healthy sandwich company. and the floral bird wall paper by Laura Ashley. These pretty mugs would be perfect for those late night cosy hot chocolates. A new addition to the group is the U.S. based Galmglow who have produced a special edition mud mask, which smelled lovely, can't wait to get my hands on some of that and have a pamper day. Long time partners Avon have produced a Viva Pink nail colour and the Avon crusade pink pin. Ghd have been working with Breakthrough for a few years now and every year they donate money from their sales of their limited edition Pink styling wands to the charity. This years metallic magenta pink paired with a paddle brush may mean that I am purchasing a new pair! There is also £20 off if you use the code 'GHD20' £10 still goes to BtBC. Another long time partner of Breakthrough is Debenhams who have chosen some of their top designers to design pieces for this years collection, including Preen, Ben De Lisi and Betty Jackson. I also had my eye on this cosy coral jumper by Warehouse. Stella and Dot have also designed a scarf, earrings, a necklace and a bracelet for this collection, they are all so pretty. I loved the cute sketchy perfume bottle and bow design on the M&S lingerie line, it is a shame that the bra does't go up to my size, but I found the satin wrap dressing gown in the same fabric does, so that is on my wish list. H was loving the Ben Di Lisi sequin dress from Debenhams. There are also pieces from Adidas, Pandora, and My-wardrobe.com . If you want to check out the full collection head over to the Lookbook you can also find out more about the Great Pink Bake Off. All the companies we saw do such an amazing job at producing a stunning line of products that donate at least 10% of the price to this brilliant charity. It is really nice to see a charity always looking forward with such a modern approach to fundraising. For instance if you are a fan of the game Candy Crush Saga, during the month of October there is a special candy to purchase that all the money from that goes to Breakthrough Breast cancer, so make sure you have look out for that one in October. Thanks again to the team at Breakthrough Breast Cancer for having us to visit. We had such a lovely, informative morning, it is always such a pleasure.